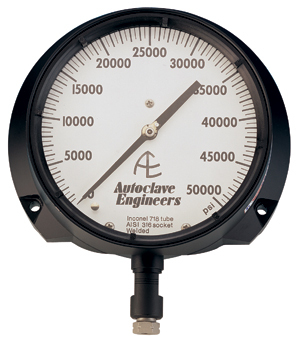 Autoclave Engineers high pressure gauges with pressure ranges from 0-1,000 psi up to 0-80,000 psi. All gauges come with a 1/4" F250C coned and threaded connection and include the collar and gland. The guages are 4-1/2" diamter face up to 20,000 psi and 6" diameter faces from 30,000 psi to 80,000 psi. Gauges - Pressure gauges are offered for use in low, medium and high pressure systems. 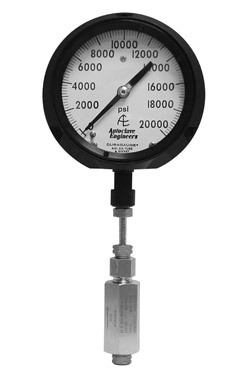 Instrument quality gauges are available with pressure to 80,000 psi (5115.7 bar). Accuracy within ±0.5% of full scale range. Plastic dial cover/solid front aluminum alloy case. Blow-out back panel for pressure relief in the event ofBourdon tube failure. Precision stainless steel movement for accuracy andresistance to atmospheric corrosion. Gauges are commercially cleaned when shipped. Gauges available oxygen cleaned upon request. Gauges glycerin filled upon request. Gauges available with dual scale face plates. Flush panel mounting - Interchangeable dial cover retaining rings are stocked to permit flush panel mounting of any instrument quality gauge. These will be furnished at an additional charge when specified - add “PM” to order number. Optional electrical contact face - Available for all instrument quality gauges. With adjustable low and high electrical contacts, this option permits gauges to provide pressure control for automatic or remote operation, or for fail-safe set points. **Bourdon tube material for 0-30,000 psi (0-2068 bar) gauge is K Monel. Bourdon tube material for 0-50,000 psi (0-3447 bar) and 0-80,000 psi (0-5116 bar) gauge is Inconel 718.